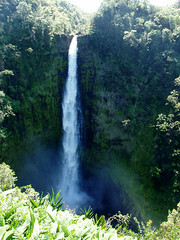 Kilauea is often called the world’s most active volcano. It’s been erupting continuously since 1983 at vents several miles away from the caldera. 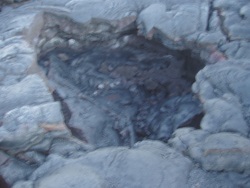 The eruptions are still inside Hawai‘i Volcanoes National Park, but the lava hasn’t stuck to the boundaries as it flows to the sea. 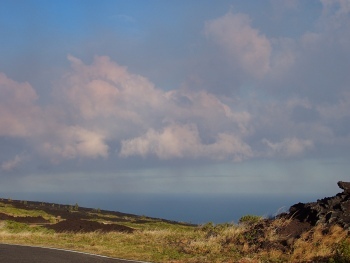 So late on an April afternoon, we started driving down Chain of Craters Road toward the ocean, hoping to see (from a safe distance) lava pouring into the ocean. The road is named because it connects a series of craters left behind by old vents. At first we stopped at all of them. 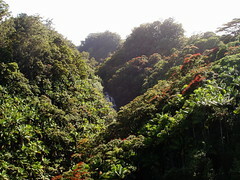 They ranged from large craters like Keanakako‘i to fifty-foot-deep holes filled with rubble a dozen feet from the road. Soon we realized that would take way too much time, and stuck with the ones that looked particularly interesting. I don’t recall which crater this one was at (probably either Puhimau or Pauahi), but there was a trail up to a wooden viewing platform. 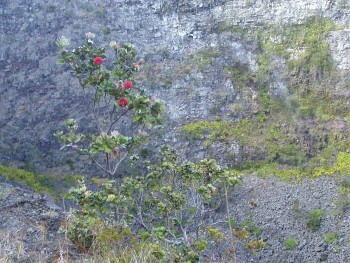 I stopped at one point along the trail and took this picture of a small tree on the edge of the crater. 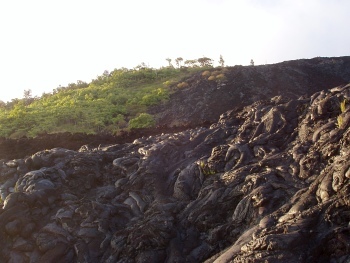 The hill below is Mauna Ulu (“new hill”), which formed during a 5-year eruption from 1969-1974. We didn’t have time to hike out to it, so we just got a couple of views like this one from spots closer to the road. As we left the forested areas up near the summit and started down the long slope to the sea, we started to notice a strange reddish cast to some of the clouds. Eventually we realized we were looking at them through smoke or vapor, though we could never figure out just what it was from. The road takes a couple of long switchbacks, and we eventually ended up east of the smoke, which put it in the opposite direction of the active vents, which were still further east. 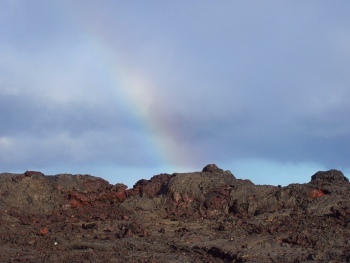 Even the vapor and dryness of the lava fields didn’t preclude Hawaii’s trademark rainbows! Along that switchback, we pulled over to the side of the road once because an old lava flow had left a very strange, knobbly texture on the side of the hill. Finally we got to the coast. Since the lava flows have wiped out several miles of road and show no sign of stopping, the park service has left it as-is, blocked the road about a half-mile from the lava, and set up a temporary ranger station consisting of a trailer and a couple of outhouses. I’m sure they’ve had to move it more than once. Unfortunately, the only place to park is by the side of the road. We had to drive down to the end, turn around, and drive another mile before we found a parking space. We were almost to the point where the road turns inland! I made two mistakes, one of which would have been disastrous earlier in the day, and one of which just limited my options for photography. The first was that I forgot to bring water. At sunset it was okay, even though I did end up walking more than three miles. At least I remembered to bring the flashlight! The second mistake… well, remember that I left my tripod in the car at the Thurston Lava Tube? I did it again, only realizing it about 25 minutes into the walk. So I was bracing the camera on rocks and getting blurry pictures in the fading light. 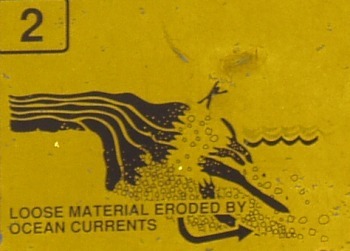 I loved this sign, both for the design (there’s something funny about the stick figure being thrown off of the cliff), and for the damage. The burnt out corner of the sign may have removed the word “danger,” but it manages to convey the concept and actually emphasize it. Here’s a blurry example of the kind of danger the sign is warning about. Just because the lava has cooled to just plain rock doesn’t mean it’s stable. Here’s a spot where there was an air pocket, and the surface just collapsed, leaving a gaping hole about 3–4 feet across. And finally… hot, molten lava action! They had created “trails” on the cooled lava using the stick-on reflector tabs you often see on roads when they’ve been resurfaced but haven’t yet been re-striped. One trail was white, another was yellow. 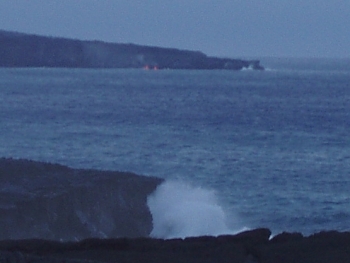 I hiked out about ¼-mile from the end of the road to a spot where I could see lava pouring into the ocean. Well, sort of. It was five miles away, and I didn’t have binoculars. Way off on the other side of the bay you can see two orange points at the base of the cliffs. During the day you can also usually see steam. You may have noticed it’s started to get dark at this point. This is where I might have turned back, but I figured it would be years before I had another chance, so I hiked back along another trail to see if I could get a better view of something. By the time I got back to the car (maybe around 7:00? ), it was fully dark, stars were visible, and Katie was asleep. And the glowing hillside was visible from the car! The drive back up Chain of Craters and out of the park took about an hour, though we had gotten used to winding roads without street lights—and intermittent rain—over the previous several days. The real challenge was finding a place to eat and a place to buy gas, since we weren’t sure whether what we had in the tank would get us back to Kailua. We stopped in Volcano Village, which is on the main highway just a few miles east of the park entrance. We found an open restaurant called Kiawe Kitchen, which had good food, though we got the impression they would have preferred that we eat somewhere else. (We were in shorts and T-shirts, we didn’t order wine with our meal, and the dishes we ordered were on the lower end of their price range.) I ate an entire pizza, which was probably about right since I had just walked 3–4 miles without water. Since the “big island” is predominantly rural, things close early. There was a gas station next to the restaurant, but it was already closed by the time we arrived. Our hotel was about 90 miles to the west in Kona, but to find an open gas station we had to drive about 12 miles east to Mountain View, buy gas at the one open station, then turn around. At that point we were only 15 miles from Hilo, the closest we’d managed all week, and we were seriously wondering whether it would be worth spending a half hour to get there and check into a motel, tour Hilo for a day and drive back to Kona at a reasonable hour. Eventually we decided that with all our clothes, medication, etc. on the other side of the island, we’d be better off going back. In the middle of the Ka‘u lava fields, miles from any lights but our own, we stopped at the side of the road to look at the stars. It was the most incredible night sky I’d seen in years. It was even better than the view from the Mauna Kea visitors center two nights later, because (except for the occasional headlights) there were no lights at all, and because it was later in the evening, probably around 10:00 or 10:30 instead of 8:00. We ended up jumping back into the car after about two minutes, though, because although we knew the insects buzzing us were probably benign, we didn’t want to take a chance. The last time we were in Hawaii, my mosquito bites took over a month to heal! It was well past midnight when we got back to the hotel. We hadn’t spotted a single open gas station until we reached Kona. 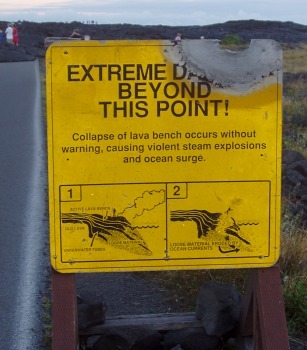 Note: This visit to Kilauea was Thursday, April 7, 2005. Update: I’ve posted higher-res copies of the photos to a Flickr album. 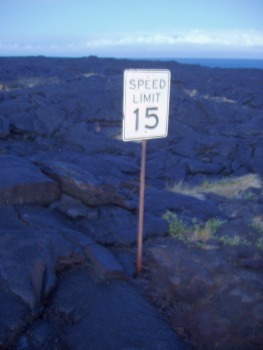 This entry was posted in Photos, Travel and tagged Hawaii, Hawaii 2005, Kilauea, Long, Stargazing, volcano on August 20, 2005 by Kelson. Let’s just say you’ll need more than an oven mitt. I love your account of this area and the photos, as well as your website! 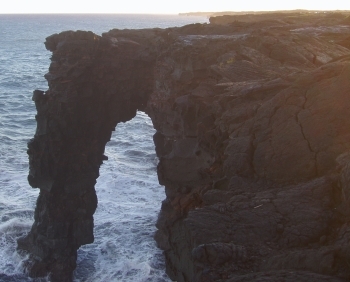 There IS so much strangeness, especially on the Big Island. The Flickr photo of the melted Danger sign was taken about the same time, 2005 or 2006. Don’t know if the sign has been replaced, but I’d guess not.